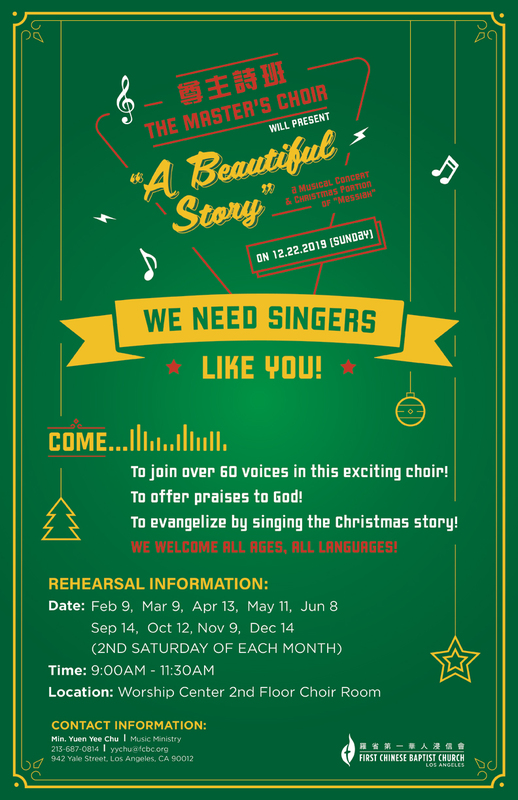 We are in need of more Tenors and Sopranos for this Christmas concert. Choir of Glory has been ministering in the English-speaking Worship Service at FCBCLA for over 40 years. Some of its original members are still faithfully serving and praising God in this choir every Sunday morning. Choir of Glory also does outreach and partners with other ministries. For more information, contact Minister Yuen Yee Chu at yychu@fcbc.org. Choir of Grace is the Chinese-speaking choir that serves in the Cantonese Worship Service. This choir is made up of multiple generations. Although many of its members are near retirement age, they still consider themselves young at heart. Choir of Grace welcomes all ages to join and serve with them. For more information, contact Minister Yuen Yee Chu at yychu@fcbc.org. Choir of Praise is a Cantonese-speaking choir. They seek to glorify God by helping to prepare the hearts of the congregation for the Word of God, blessing through the singing of anthems, leading in congregational singing, and being a good example through their life testimony. Rehearsals are every Sunday from 2pm – 4pm. For more information, contact Chris at chrisswchu@yahoo.com. The Master’s Choir is a combined choir that serves at special events. Rehearsals are the second Saturday of each month between September and May. For more information, contact Minister Yuen Yee Chu at yychu@fcbc.org.